In South Indian cuisine, there is nothing simpler than a rasam. 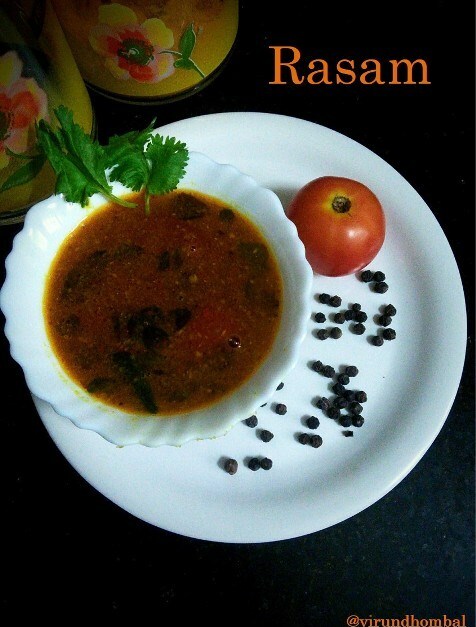 Rasam is prepared with lots of spices and flavours and just takes a few minutes to prepare with simple process. 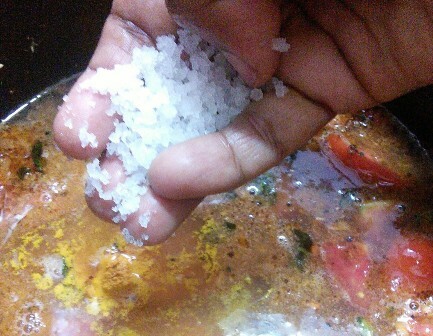 If you prepare a perfect rasam your tongue will ask you to eat for one more time. The perfect rasam will have a balance of flavours that comes from the garlic, pepper, cumins and coriander leaves. 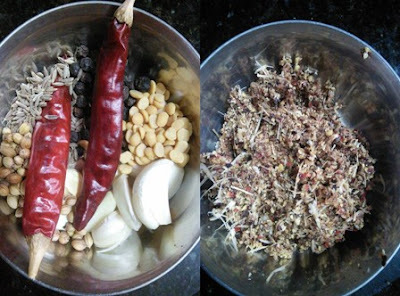 The garlic, pepper and cumins gives the powerful flavour to the rasam. 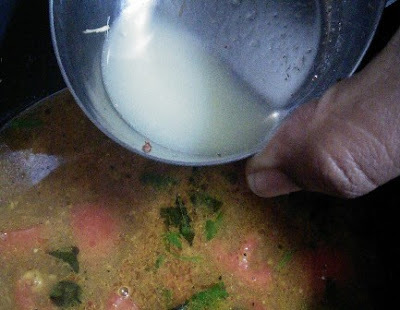 There are a few tricks for cooking a good rasam. Do not load it with too much of spices for the ground paste. Use all the flavours in minimal amount, so that you can have a nice flavourful rasam. Do not peel the garlic cloves fully. Just cut the top and then grind it. This is my mother's tip. You will feel the aroma of the garlics, when you taste it. 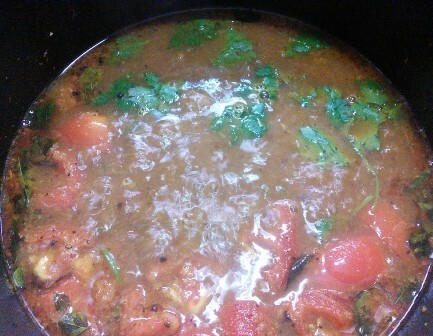 The tomatoes, add taste and colour to the rasam. 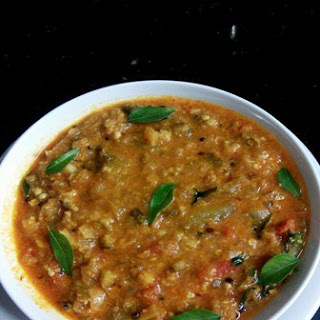 It's beautiful to see the chopped tomatoes floating on the top of the rasam. Try to chop the tomatoes finely or give it a gentle crush with your palm before sauteing. 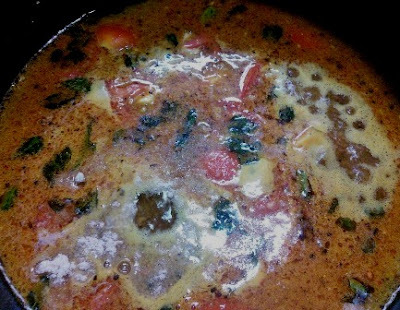 Do not allow to boil the rasam for more than 5 minutes. Because it will diminish the flavours. As soon as you finished, close it with the lid. Rasam is prepared with lots of spices and flavours and just takes a few minutes to prepare with simple process. 1. Soak the tamarind in hot water and extract the juice. Chop the tomatoes. 2. Take all the spices one by one ( 3 tsp pepper, 1.5 tsp cumins, 2 dried red chilly, 1/2 tsp toor dal, 1 tsp coriander seeds and 8 garlic cloves). Grind it without any water. Rinse the mixer jar with little water and add this water to the tamarind extract. 3. Heat the oil in a vessel and add the fenugreek. When it sizzles, add the mustard and urid dal. Allow them to crackle and add the ground coarse paste. Next, add the tomatoes and curry leaves. 4. Now add the tamarind extract, turmeric powder and required salt. 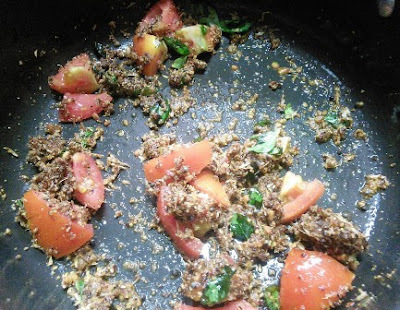 When it starts boiling, add the asafoetida powder and jaggery. 5. Close it with the lid and allow them to boil for a few more minutes till you see a foamy layer. Add coriander leaves and switch off the flame. 6. Finally add the lemon juice and close it with the lid. Serve it with hot rice. 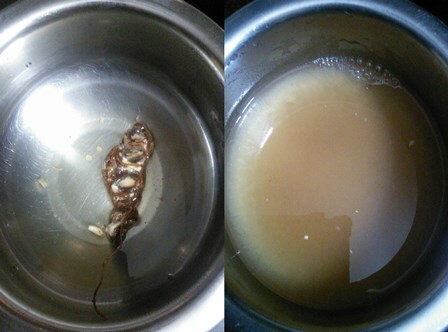 Soak the tamarind in hot water and extract the juice with 1 cup of water. Take all the spices one by one ( 3 tsp pepper, 1.5 tsp cumins, 2 dried red chilly, 1/2 tsp toor dal, 1 tsp coriander seeds and garlic cloves). Grind it without any water. Rinse the mixer jar with little water and add this water to the tamarind extract. 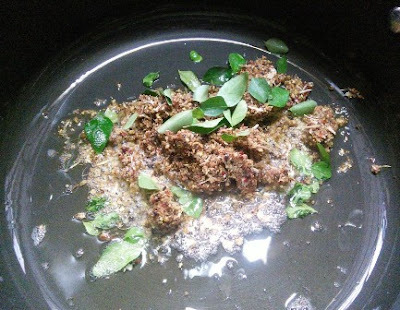 Heat the oil in a vessel and add the fenugreek. When it sizzles add the mustard and urid dal. Allow them to crackle and add the ground coarse paste and curry leaves. Stir it continuously for 2 minutes. Next, add the tomatoes. Stir it well. Now add the tamarind extract, turmeric powder and required salt. Mix them well and add some more water or dal stock if it appears thick. When it starts boiling add the asafoetida powder and jaggery or sugar. Close it with the lid and allow them to boil for a few more minutes till you see a foamy layer. Add the chopped coriander leaves and switch off the flame. Finally add the lemon juice(optional) and close it with the lid. Serve it with hot rice. 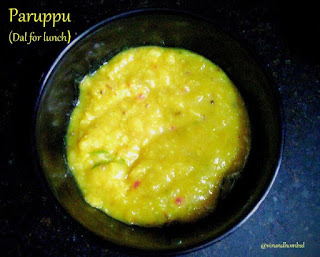 We usually serve rasam along with cooked toor dal (paruppu) and pachadi. We mix the paruppu and rasam with a tsp of ghee. Ladies finger pachadi, paruppu and rasam are the best combinations.